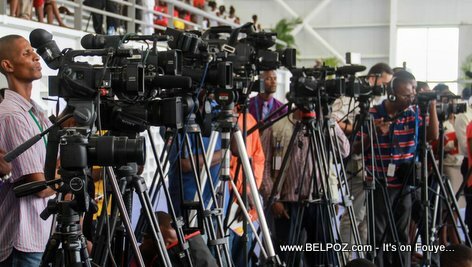 En Francais: Question: Pourquoi les médias haïtiens essayent-ils de prouver qu'Haïti est un pays de merde? Haitian prime minister Jack Guy Lafontant said recently there is no insecurity in Haiti. It is the media who is inflating the news to make it apear as though Haiti is has insecurity. The Haitian media went dead in the ghetto looking for opinions, to prove him wrong, to prove that Haiti is S**t Hole country filled with insecurity and no one needs to bother coming here. You are looking opinion about insecurity in Grand Ravine? Of course they're going to say there is insecurity in Haiti but, is that the only opinion that exist in the entire country? Ghetto life represent only one sector in any country. Crime rate is usually higher than average in any ghetto, anywhere in the world. But are you going to judge an entire country by what the people in its ghettos think? Is the Republic of Haiti a big ghetto where everyone feels unsafe? I didn't grow up in Petionvile, or Montagne Noir, or wherever the prime Minister is from and I don't live there neither but I have to tell you, in the small town where I live in Haiti, I don't wake up everyday wondering am I going to die today. It is wrong when the media from within a country is trying to destroy it just to make a few bucks or have a few more listeners. You may agree with what I just said, you may disagree, but I need your opinion on this. Our country has it's problem, does that make it a s---hole? You've said it: Money! And the media have to know the ill service it shows to your country. I have a great respect for the Haitian people and the History of Haiti, as Juan Pablo Duarte, our forefather, also expressed in the past. I only have a difference of opinion with those Dominicans who claim that the island is "One and indivisible". Haiti is a great country and we need to give a proper name (Quisqueya) to our country, to make clear that there are two "Dominican Republics" (in the island of Santo Domingo or St. Domingue). Quel est le problème avec les médias haïtiens? Est-ce qu'ils se soucient même de l'image d'Haïti? La plupart des nouvelles haïtiennes sont si unilatérales.